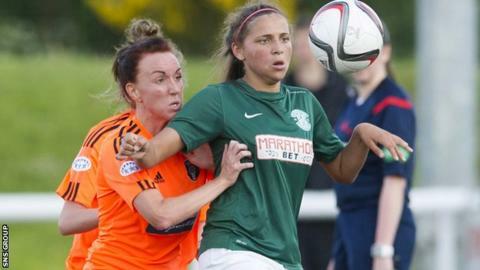 A Siobhan Hunter header earned Hibernian a 1-0 win at Celtic in the Scottish Women's Premier League. The Edinburgh side stay locked on points with leaders Glasgow City, who beat Spartans 2-0. Forfar Farmington enjoyed a 7-0 victory against struggling Inverness City, with Holly Napier scoring twice. Aberdeen beat Rangers 2-0 to move up to third place, Stirling University overcame Hutchie Vale by the same margin and Hearts edged Hamilton 1-0.